katydid, originally uploaded by jahansell. I'm not back, exactly, at least not on a daily basis, yet. But I've so appreciated the comments I've gotten that I feel very encouraged to keep going. Especially having met someone this weekend who has been using my blog as a guidebook, now that he's moved to Sharon from far away (not because of my blog though!) I had to laugh when he said he went into Terni's and asked for a milkshake - I could have predicted the gruff response! I should apologize to Phil Terni for sending people there! Anyway, this katydid was so pretty - it's on a pumpkin flower in my garden. I will return after Labor Day, in some form - if not daily, then at least a few times a week! Since I"m not taking any other kind of vacation, this break will have to suffice! A wonderful photo! The katydids have been noisy around Selma the past week or so! Glad you reconsidered! Love the effect of the insect on the blossom. Great photo and how wonderful that your blog is used as a guide book. 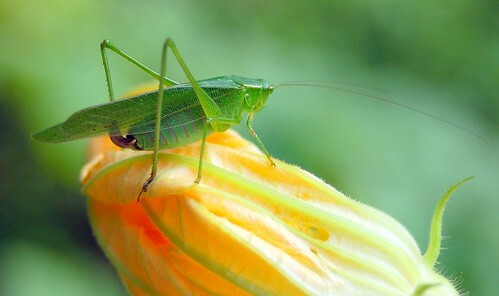 Do you know why it is called a "katydid"? Not a name I've heard before. wow nice photo soo vibrant and alive. Super photo. Wondrous colours and detail. Never heard of a katydid. Wonder if we have them in Europe under a different name? A friendly creature. The Katydid here are smaller this year. Guess it must be related to the drought. Our tomatoes are golf ball size but still good. I think it is great that someone is using your blog as a guide! And you shouldn't have to apologize for sending someone business:) You'd think they would appreciate the business;) hee! I am glad you are considering continuing a few times a week. Welcome back! Lovely shots! There are many of us (Class of '78 HVRHS) who look at your photos every day and then email each other with comments...we think you are FABULOUS!!!!!!!!!!! !